The last time Benji was hospitalized, he got both B and me frantic with worry! Besides refusing to eat or drink, he was all wobbly when he walked. He was limping a little too but he wasn't suffering from a minor wound. We were certain of that because we checked him all over for any signs of cuts or bruise but didn't find any. So we put away our wound cleanser for cats and took him to the neighbourhood Vet instead. When Benji still didn't show any signs of recovering, we immediately rushed him to Healing Rooms pet hospital in Subang Jaya for a second opinion. Apparently, Benji was suffering from a type of feline condition with a long weird name, which I can't recall. And if left untreated, he would not have made it another night! See how adorable Benji looked with his neck collar? 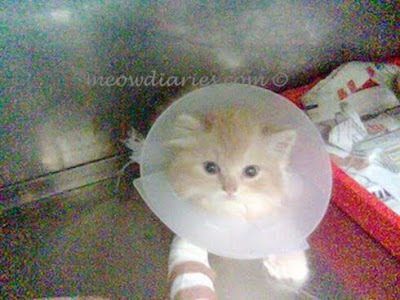 He's completely healed now of course but ever since that scary incident, we don't take chances with our cats any more. So whether it's a small cut or a hidden wound that our cats might be suffering from, we'd surely take them to the Vet for an immediate check-up. Better be safe than sorry! Yeah GP.. better be safe than sorry for sure.. I take no chances with my babies too! 8-) 8-) 8-) And Bill Meow 3! Oh gosh he looks so cute, poor thing with his color on. And you are so right about taking them to the vet. If they quit eating or hide, they probably don't feel good and should be taken to the vet. Thanks Angel! I think the SJ hosp has moved nearer to Subang Parade but I cant remember exactly where!